There was only one lecture and one panel discussion today. 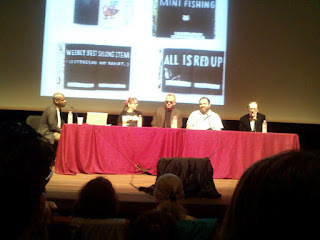 There is nothing in comics more awesome than seeing Robert Crumb, Lynda Barry, Gary Panter and Ivan Brunetti on stage together. Especially when Panter calls you out from on stage. (I was 'the guy in the hat.') And even more especially when Crumb closed things down by singing -- yes, singing -- You're Bound to Look Like a Monkey When You Grow Old.